UNITED STATES: Three offshore wind developers have signed a memorandum of understanding to use a Massachusetts port as a staging and deployment base for future wind projects. Dong Energy, Deepwater Wind and the newly-owned OffshoreMW have agreed to use the port for their future projects. OffshoreMW was acquired by Danish invesment firm Copenhagen Infrastruture Partners in August. Each company holds leases to sites off Massachusetts' coast, with a combined potential of approximately 3GW of wind energy. In July, Massachusetts passed a bill requiring local utilities to buy power from up to 1.6GW of offshore wind capacity by July 2027. 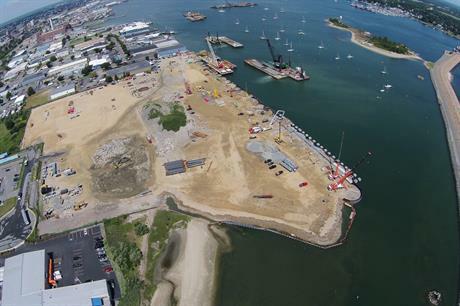 In September 2014, the New Bedford Marine Commerce Terminal was earmarked for use by Cape Wind for its ill-fated 468MW offshore wind project. Cape Wind suffered major setbacks in early 2015 after losing its power purchase agreements with local utilities following years of litigation. In January 2015, Cape Wind's developers pulled out of the lease to use the port for its staging.